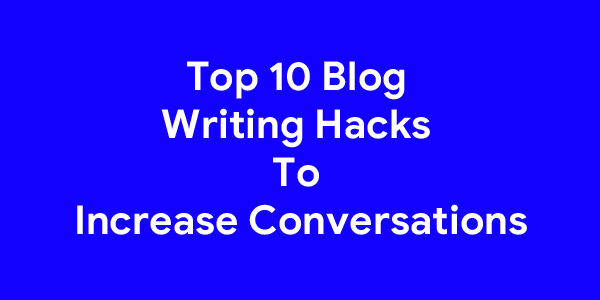 Top 10 Blog Writing life hacks Hacks To Increase Conversations. Although you are putting a lot of effort into your blogs, the outcomes were not favoured in your side. writing tips It results in less number of leads. This shows something went wrong. Most of the people are not interesting in reading your blogs even they appear in social media sites like Facebook, LinkedIn etc.. So, you have to do something which you were not done yet. That is nothing but the implementation of blog writing hacks. This method helps a lot in improving the conversations. What Is Meant By “Blog Writing Hacks”? Now we have to look “What Blog Writing hacks really mean?”, “How it works?”, “How it improves the conversations?”. Let’s see. Begin with the targeted audience and figure out the topics of your blog. If we do the right actions, then the right things will happen. Every blog writer should that there are only 2 to 3 seconds of time to grab the attention of the audience. It seems like an early bird catches the worms. If you attract the viewer with the first lines then automatically they connect to your blog very easily. Here are the top 10 blog writing hacks. It is very important to know about the requirements of your targeted audience. Of course, it is not much related to writing, but it plays a crucial role in improving the conversations. It is not the right way to guess the targeted audience, we should do some competitor analysis. If you know the best audience for your product then it is very for you to draft the valuable content. By understanding the audience it is very helpful to write in a suitable tone and style. For example, you choose a professional tone of writing in explaining the programming languages. While in some cases you can use some other tone of writings depending on the requirement. In the audience point of view, they just need how the products & services impact their needs and requirements. The topics that are choosing by the blog writers should be the challenges of the audience. So that more people will connect to your blog. The challenges should serve as your blog topics, addressing the pain points and answering common questions. Hence more conversations will increase and creates interest because people often want to find the answers for their problems. After gathering the information about the targeted audience its time for you to figure out the searching topics. There are some methods to search keywords like Google Adwords, Keyword Tool, SEMrush, and Twitter Advanced Search. Of those tools, SEMrush is paid one, but it gives the suitable keywords set. As we discussed earlier that we have only a few seconds to force the content and to take the notice of the reader. Suppose if the heading is not attracting then there is very less chance to scroll down. Headlines are very important for the blog success and it leads to significant conversion rates. Before going to the final stage we should pass them in different online headline analyzers. The blog should offer a solution but not the complete answer. It should provide a suitable framework that solves problems and offer valuable, actionable information. We should leave enough details so that people may call you or ping for the desired action. We have to break the long posts into small clear explanations. Visitors are not interested in reading the paragraphs without headings in crucial points. So, we have to add the required headings and sub-headings. One important thing is that many readers skip reading the whole content, they only focus on the sub-headings. So, it is our duty to attract readers with proper and required sub-headings in the bog then the readers will stay on the page. Bullet lists also play a crucial role like headings and sub-headings. Bullet points emphasize the main points and can quickly be skimmed through. The following tips are the most useful bulleted items. Make sure that all items are equal. Highlight the main points, features or benefits. The human brain is capable of picking visual image content faster than the normal text and keep information very better way. Add the attractive images that are suitable for the blog. The reader can easily connect with the images, if that image reflects the whole content then it will add plus point to the blog. Images play a very important role in technical blog topics like data science. It doesn’t mean we should not completely depend on SEO and at the same time don’t forget the importance of SEO. Organic searches lead to more traffic to websites and blogs. Understand the importance of ranking factors that the blog follows the requirements of SEO. The following are some of the tips to increase organic traffic. Make use of keywords correctly. Use Proper meta titles and meta description. Include anchor links in between the article. All the blog posts should be very clear with CTA (Call To Action). Should know what exactly the reader wants. Whether you want to share the post, write a comment or buy the product. You will lose leads if you don’t have better CTA even though your post offer significant content. Good CTAs directs towards creating urgency, action and compelling the blog visitors to respond. It is very important to place the visitors in visible positions.